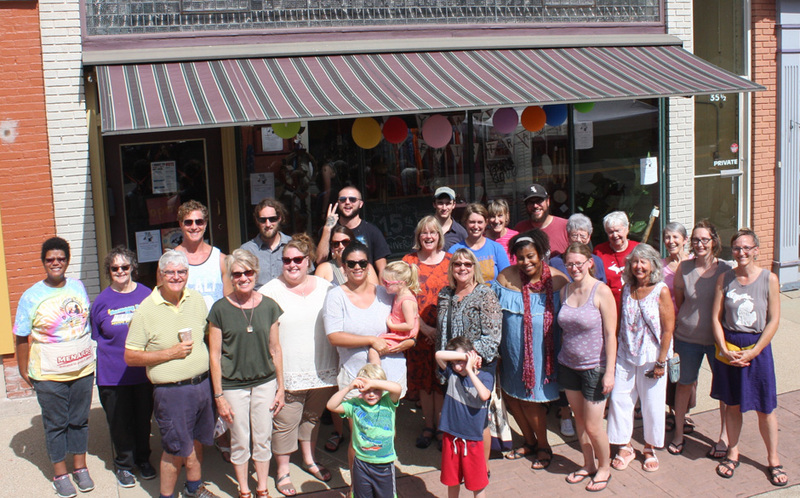 On Sunday during the 25th Annual HarmonyFest in Downtown Three Rivers, our little store celebrated its 15th Anniversary! During those 15 years, our faithful volunteers have spent more than 31,000 hours running the store and connecting our community with artisans and farmers from around the world. To celebrate, we gave away 15 prizes throughout the day, served special treats in the store, and commissioned our friend Elisabeth Wenger to write a poem, which she read from the main stage at 6:30 (see below). Thank you to everyone who helped us celebrate … and here’s to 15 more years! A store is never just a store. of, in minds expansive and strange. the branching electricity in your brain? as long as the people keep caring. Fifteen years these people have cared for a store! keep dreaming, keep the passion. We Have all Your In-Between Weather Needs! This rainy weather is good for Spring flowers, not so good for us! World Fare has all your hot drink and soup needs covered. We have over 30 types of tea. Plus soups and other hot yummies. And don't forget our colorful assortment of scarves, and cozy socks. So come on over! We've got coffee brewed and a great space for conversation, news paper reading, and peaceful shopping. 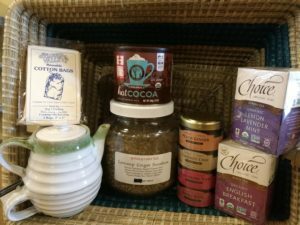 It’s time for March’s First Friday and we thought that it would be fun to have a special night and a series of posts highlighting women in history and/or fair trade to celebrate Women’s History Month! The fun starts this Friday, March 2, 2018 5pm-8pm. 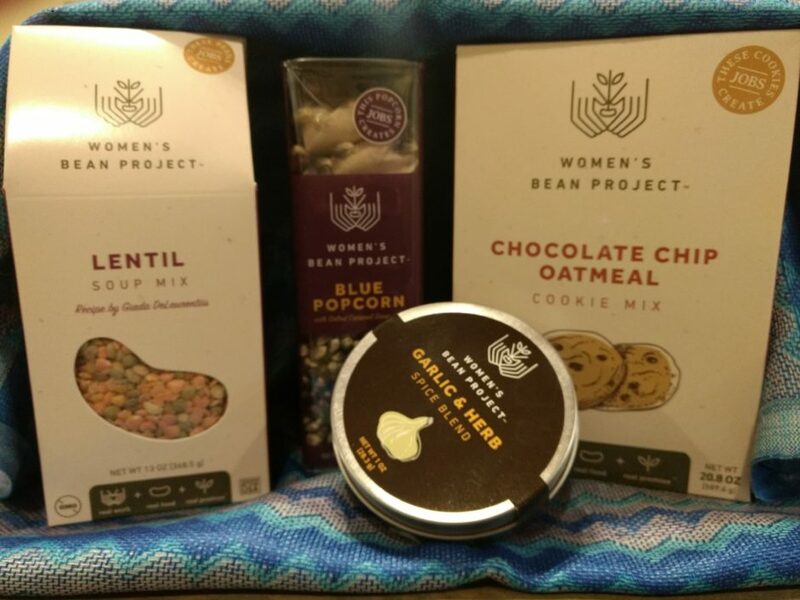 We will have samples from Women’s Bean Project for you to try AND all Women’s Bean Project products in the store will be 10% off. Be sure to stop in, we will have coffee as usual and plenty of conversation! 2016 Chocolate Affair a gooey, delicious success! 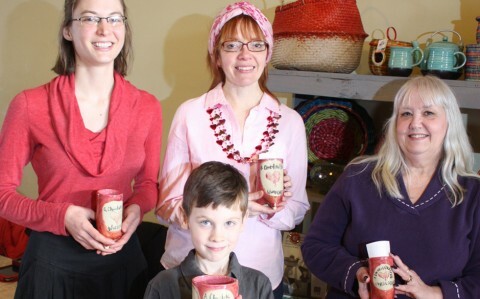 Pictured from left to right: Elisabeth Wenger, Karen Keefer, Becca Sonday and Lorie Minor. The weather outside was frightful, but inside World Fare on February 13, the crowds were warm with good conversation and tasty treats as we celebrated A Chocolate Affair 2016. Seven area bakers brought their best recipes for visitors of all ages to taste and vote on, with celebrity judges Tricia Meyer (Three Rivers Downtown Development Authority) and Brother Abraham (St. Gregory’s Abbey) offering their professional opinion on the best presentation and most original. 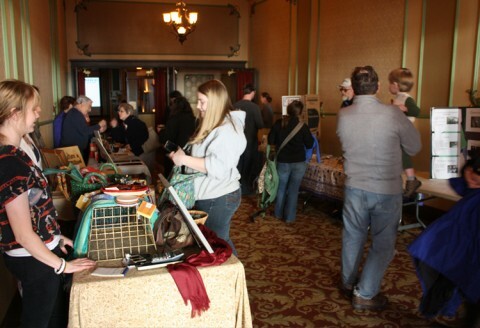 Thank you to all who came out to make the Affair such a successful event in support of World Fare’s fair trade mission! Well, the weather outside was frightful, but frigid temps and blowing snow are not enough to keep our local chocolate lovers away! 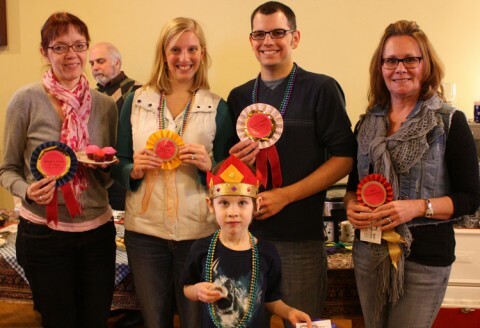 The 2015 A Chocolate Affair was a great success with over 120 people coming through to try the delectable treats dreamed up by a dozen different bakers and baking teams. 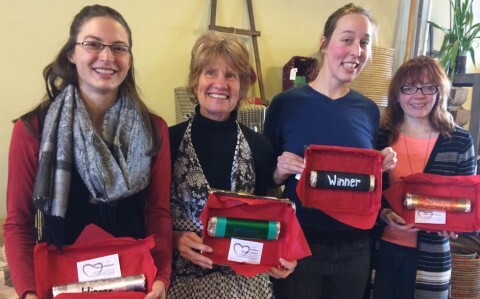 World Fare sends a huge thank you to all who entered, and a big congratulations to this year’s winners, who each went home with a World Fare gift certificate and a special edition, handmade Valentine’s vessel from our resident potter, Elizabeth Brouwer. Thank you also to our local celebrity judges, who braved the cold to select our winners for Most Original and Best Presentation: Beth Hubbard (Corey Lake Orchards), Melissa McPherson (Three Rivers Public Library), and Brian Persky (Three Rivers Downtown Development Authority). World Fare continues to be able to pursue its mission of supporting economically disadvantaged communities around the world because of the amazing support of our local volunteers, customers and chocolate aficionados! World Fare is delighted to announce our three local celebrity judges for A Chocolate Affair 2015! Melissa McPherson is the director of the Three Rivers Public Library. Brian Persky is the director of the Three Rivers Downtown Development Authority and the Michigan Main Street program. And Beth Hubbard is the manager of Corey Lake Orchards and the daughter of the farm’s co-founders, Dayton and Allene. We are so thankful to our judges, not just because they’ll join us tomorrow to determine the awards for Most Original and Best Presentation, but for the good work they do in our community in such a wide variety of areas. Join us tomorrow 2-3:30 p.m. to taste and vote for delectable fair trade chocolate goodies! Tasting is free and voting tickets start at $1, with all proceeds supporting World Fare’s mission of partnering with economically disadvantaged communities to encourage a living wage for our world’s most vulnerable workers. What a perfect way to spend Valentine’s Day: celebrating the love that goes out to cocoa farmers around the world through our conscious choice for fair trade chocolate! P.S. – Fun Winterfest activities will be happening throughout downtown Three Rivers from noon-4:00 p.m. Come out to enjoy the snow and see how our local merchants are brightening up the season! Get your chocolate fix on Valentine’s Day! 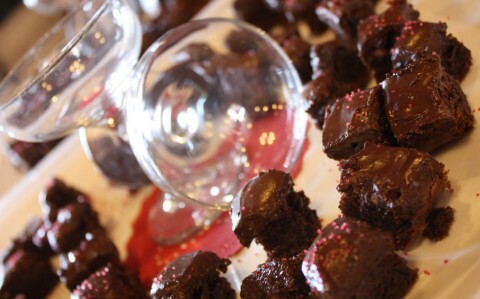 Join us this Saturday, February 14, for our Annual Chocolate Affair bake off! From 2:00 – 3:30 p.m., taste delicious treats from 10 local bakers for free; then vote for your favorites to win People’s Choice awards. Voting tickets start at $1 each, with quantity discounts. 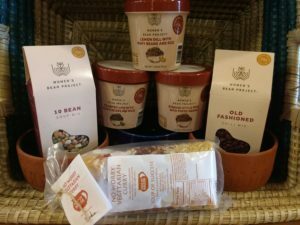 All proceeds from voting go toward World Fare’s efforts to support economically disadvantaged farmers and artisans around the world. And while you’re downtown, be sure to check out all of the WinterFest activities happening throughout downtown Three Rivers from noon – 4:00 p.m. Bring someone you love to celebrate Valentine’s Day in a PLACE you love! 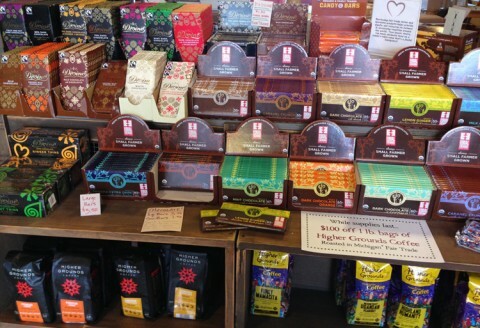 We just got a shipment of chocolate in from Equal Exchange, so our stock is filled with great chocolate options! Try dark chocolate with lemon, ginger and black pepper. Or milk chocolate with a caramel crunch and sea salt. And there’s always the classic 85% dark chocolate. So many choices! 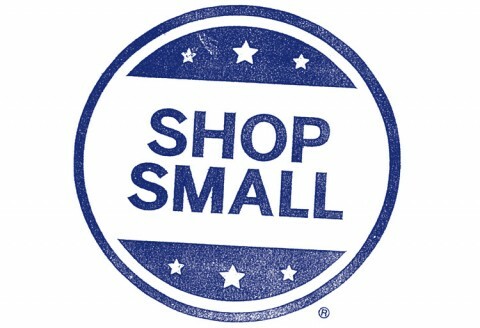 And remember: our Higher Grounds coffee in their old packaging is at least $1.00 off per pound (and some is 25% off)! Stop by quick to take advantage of a great deal. Every year, World Fare, along with a handful of loyal contributors, manage to put on a film festival in Three Rivers revolving around social justices issues affectionately dubbed, “Rivers of Justice.” This festival is held in beautiful downtown Three Rivers at the historic Riviera Theatre, and is both a fundraising event for World Fare and an attempt to spread the messages of social justice, community development, and fair trade to Three Rivers and beyond. The first film, Bananaland, gave a shocking inside view into the banana industry. Dole, Chiquita, Del Monte, and a handful of other high profile banana growing corporations were put under the looking glass and exposed for their terrorist-supporting and extreme profit-minded business practices. We saw in this film the human side of the banana industry, how the pesticides present in such mass quantity can destroy the lives of those who are unfortunate enough to live near or around a banana plantation in South America. Our second film, The House I Live In, centered on the problems caused by the War on Drugs: a war that has raged for decades and has seen virtually no success in slowing down the trafficking of drugs in and around the United States. This film is a harrowing look into the racial and socioeconomic overtones present in the lawmaking and judicial sides of our government. The final film, If You Build It, ended on a hopeful note, following a group of high schools students and their unorthodox shop class teachers as they seek to construct a Farmer’s Market for their small town. This film showcases positive ways of engaging students who often balk at the traditional methods of education, and gives us insight into what can happen when a community comes together around an idea. We’d once again like to thank everyone who contributed food to the potluck, donations to the festival costs, and especially to everyone who came out to watch these important films. We hope to see even more folks at next year’s Rivers of Justice Film Festival!